KIEV, Ukraine -- President Viktor Yanukovych on Thursday instructed Prime Minister Mykola Azarov to make sure Ukraine is ready by April 2 to initial a political association agreement with the European Union. 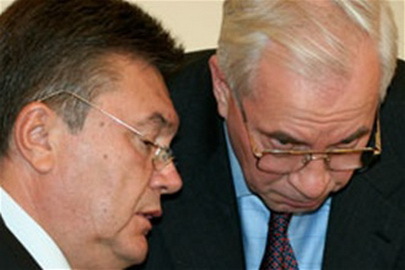 Viktor Yanukovych (L) and Mykola Azarov. Yanukovych also ordered Azarov to negotiate and to secure massive financial assistance from the EU for the implementation of the agreement. The agreement was originally supposed to be initialed at a Ukraine-EU summit in Kiev on December 19, but had been postponed indefinitely amid concerns in Brussels the Ukrainian authorities had been persecuting opposition leaders. The latest instructions come as relations between Kiev and Brussels reached a new low earlier this week following a sharp exchange between the authorities and the office of Catherine Ashton, EU’s foreign policy chief. The Foreign Ministry on Tuesday issued a note attacking Jose Manuel Pinto Teixeira, the EU Ambassador to Ukraine, accusing him of meddling after his critical remarks about business climate in Ukraine. Yanukovych’s instructions, published on the presidential website, were presented as an attempt to promote Ukraine’s European integration. This triggered criticism from Ukrainian bloggers, who said Yanukovych, with his twisted foreign and domestic policies, is out-of-touch with reality. “He tries to expel Teixeira from the country,” Santim, a blogger, wrote on Thursday. “This is a total schizophrenia… Yanukovych is facing European isolation, but he is playing it like nothing has happened,” another blogger, Ratybor68, wrote. The relations between Ukraine and the EU have started to worsen quickly after the jailing of former Prime Minister Yulia Tymoshenko for seven years in October 2011. These further deteriorated after the jailing of Yuriy Lutsenko, a former interior minister in the Tymoshenko government, to four years earlier this week. Brussels saw Tymoshenko's and Lutsenko’s trials as politically motivated and has put off the signing of bilateral agreements on political association and free trade over the issue. Teixeira said recently that Ukraine’s business climate had been getting worse, and that the signing of a free trade deal between the EU and Ukraine had been "undermined" by the use of selective justice for political purposes. Ukraine ranked 152nd out of 183 economies included in the World Bank survey Doing Business 2012, after coming 149th in the previous annual survey. It has one of the worst tax systems in the world, according to the survey.